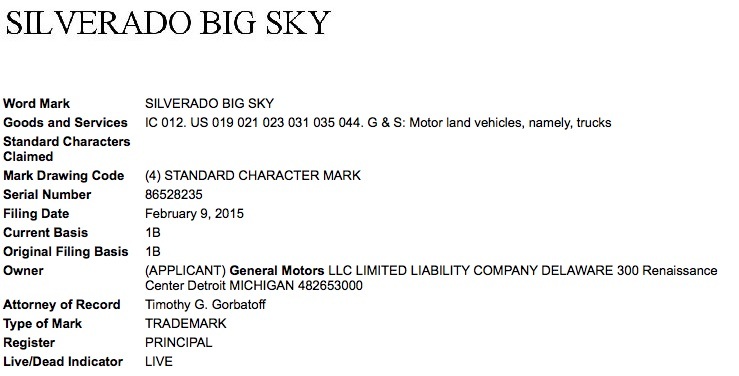 General Motors has filed an application to register the term “Silverado Big Sky” as a trademark with the United States Patent and Trademark Office (USPTO), GM Authority has discovered. The application seems to foreshadow yet another variant of the popular Chevy Silverado pickup truck. But what kind of additional equipment could a Silverado Big Sky bring? Perhaps a panoramic moonroof that reveals the “big sky”? What do you think? Share your thoughts in the comments. Previous story Are These The Priced Options Of The 2016 Cadillac ATS-V? What’s in a name? The only thing wrong with the Saturn SKY was its name, turned a cool roadster into a chick car. Do we really need another “trim” package? Big Sky big deal. I agree Paul I am afraid this is just another trim package. With a few bolt on items and who knows a special blue color? I understand why they offer these as they generate attention and the do add profitable sales but I do wish they would add a couple real new models. They do this special deal over on the Camaro which is fine but they at least still gave us the Z/28 too. It may be they will hold up till the 2017 year for the 2018 trucks as this is when the next major changes will arrive? Having been in Big Sky country a few times, an image comes to mind. Many of the pickups you see are high-end ranch trucks. They’re normally dinged and dirty. Even the ones with single rear wheels mostly have soot puffers for engines. The pickups with several seasons under their belts often have baby lift kits and oversized tires. Pickups out that way do have a look to them. A working man’s pickup for open territory and long stretches of road. Or, a pickup for those of us that want -or wish- to be part of that image. Could be a power moonroof. Or a convertible. Or maybe just a sky high price.